At Sharp Business Systems, we offer a consultative approach that helps our clients to better communicate both internally and with their clients to drive business success faster. We accomplish this through four primary forms of communication: Document-Based, Image-Based and Collaborative-Based Communication, all supported by a strong infrastructure and Network Services. This unique approach is called the Communication Continuum. We strive to apply best practices and top-notch technology in each space to bolster communication and continuity, from your lobby all the way to your server room. Are your current methods very document intensive, which raises cost and lowers security of information? Does your staff truly understand how to share information and collaborate with tools that advance projects and encourage teamwork? Do your staff members understand the importance of the team knowing team goals and objectives and how the results are matching up with those goals and objectives? We can help determine your priorities and what you’d like to accomplish in these areas, then we start the Communication Continuum process in the space that makes the most sense for your organization. Our specialists pinpoint potential opportunities for improvement within that space and unearth unanticipated solutions along the way. After the discovery process, we’ll join forces once again to devise a Communication Continuum plan that’s right for your organization and budget. Our ongoing customer account reviews let us gauge the success of the plan to ensure we are continually improving technology in each of the four spaces. Let us start the discovery process today. 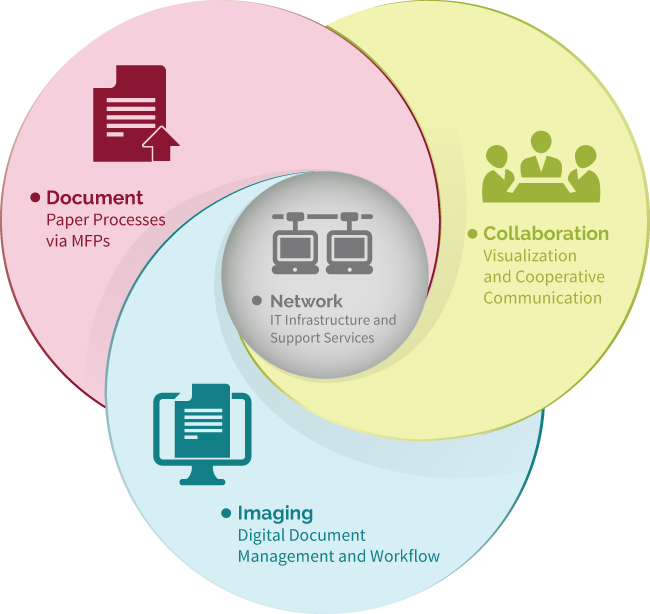 We’ll deliver assessments for your Document, Imaging, Collaboration and Network spaces, so you can make intelligent decisions based on your actual data.